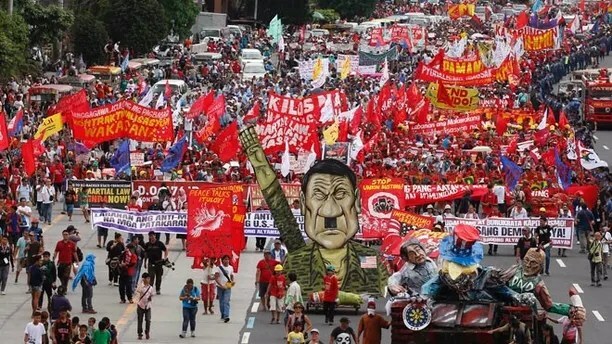 The fiery and unpredictable Duterte initially faced off against thousands of protesters who showed up to demonstrate during his speech to Congress on Monday. Thousands of protesters march towards the Lower House with an effigy of President Rodrigo Duterte. The government recently halted preliminary peace talks with communist rebels after attacks on Philippine security forces last week. Philippine President Rodrigo Duterte delivers his second State of the Nation address. Duterte reiterated his plea for Congress to re-impose the death penalty for drug offenders and other criminals, and said he would not stop his deadly crackdown on illegal drugs. “The fight will not stop until those who deal in (drugs) understand that they have to stop because the alternatives are either jail or hell,” he said. Duterte also addressed the United States in his speech by demanding America give back three church bells that were seized more than a century ago in the Philippine village of Balangiga. “Give us back those Balangiga bells…They are part of our national heritage … return it to us, this is painful for us,” Duterte said in the speech at the House of Representatives — with the U.S. ambassador in attendance. 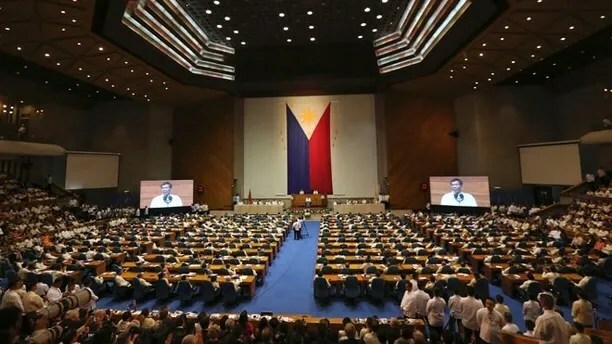 Duterte is the Philippines’ 16th president and the annual State of the Nation speech was only his second during his non-renewable term 6-year term.